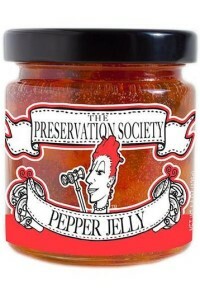 The Virginia Chutney Company has developed a new Pepper Jelly under a new brand 'The Preservation Society'. The Preservation Society struggles daily to preserve both the fine art of lifting hand to mouth, and the historically significant tradition of putting tasty things in jars. Ingredients:pure cane sugar, apple cider vinegar, red bell peppers, green bell peppers, jalapeno peppers, pectin, habanero peppers, citric acid.